Democrats say that contradicts a high-profile announcement by Interior Secretary Ryan Zinke. WASHINGTON — The Trump administration’s promise to exempt Florida from an offshore drilling plan is not a formal action, an Interior Department official said Friday in a statement that Democrats said contradicted a high-profile announcement by Interior Secretary Ryan Zinke. 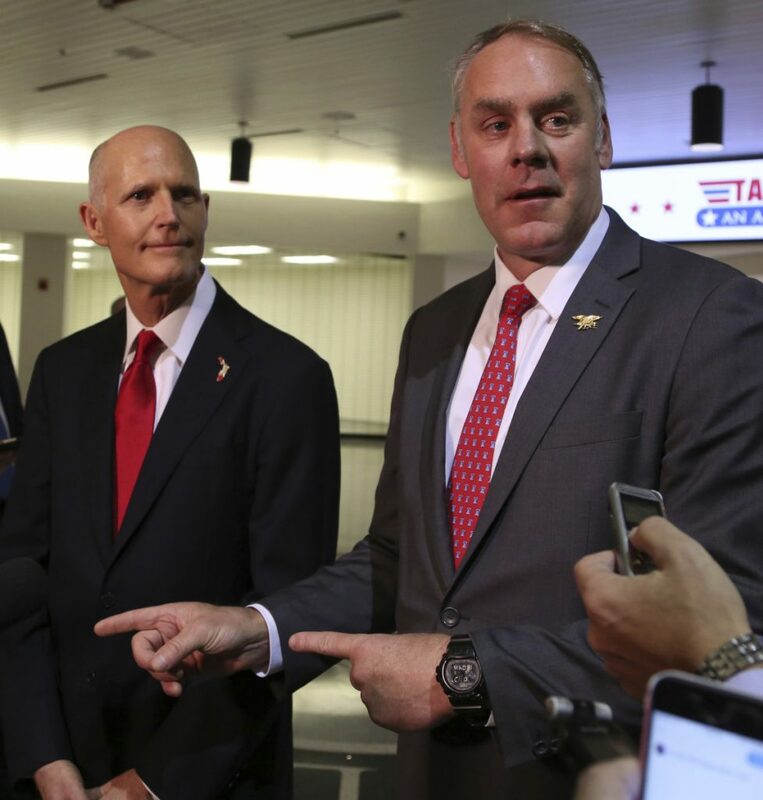 Zinke has proposed opening nearly all U.S. coastline to offshore oil and gas drilling, but said soon after announcing the plan that he will keep Florida “off the table” when it comes to offshore drilling. Zinke’s Jan. 9 statement about Florida “stands on its own,” said Walter Cruickshank, the acting director of the Bureau of Ocean Energy Management, but there’s been no formal decision on the five-year drilling plan. “We have no formal decision yet on what’s in, or out, of the five-year program,” Cruickshank told the House Natural Resources Committee at a hearing Friday. Zinke’s announcement about keeping Florida off the table, made during a Tallahassee news conference with Florida Gov. Rick Scott, will be part of the department’s analysis as it completes the five-year plan, Cruickshank said. Democrats seized on the comment to accuse Zinke of playing politics by granting the Republican governor’s request to exempt Florida while ignoring nearly a dozen other states that made similar requests. Florida Sen. Bill Nelson called Cruickshank’s comments “stunning” and said they confirm what he and other Democrats had suspected – that Zinke’s statement was “nothing more than a political stunt” to help Scott run for Nelson’s Senate seat. Scott is a friend and ally of President Trump, and Trump has urged him to run for the Senate. Zinke’s promise to take Florida off the table was “just empty words” until he takes formal steps needed to publish a new draft plan that excludes Florida, Nelson said. Heather Swift, a spokeswoman for Zinke, called the claims by Nelson and other Democrats false. “Cruickshank simply said BOEM will finish the legally-required analysis of the planning areas, as is always done for all planning areas,” Swift said in an email. Zinke announced plans two weeks ago to vastly expand offshore oil drilling from the Atlantic to the Arctic and Pacific oceans, including in more than a dozen states where drilling is now blocked.